This post is a response to a question in the comments section. The indented colour-coded section are Bart Ehrman’s claims; all links are to other Vridar posts where I have discussed topics more fully and presented evidence for the statements made here. The earliest followers of Jesus were convinced that he was the messiah. How do we know? Because they called him this, repeatedly, constantly, all over the map. As I have explained, the word “messiah” comes from the Hebrew word for “anointed one.” In Greek, “messiah” gets translated as “christ.” So anyone who says Jesus Christ is saying Jesus the Messiah. We have late gospel stories about Jesus being understood by a handful of followers as the messiah. The authors tell us nothing about their actual sources for any specific detail they narrate; nor do the authors explain why they change certain accounts of other authors writing about the same sorts of things. The stories are told as “tall tales” by our standards. Yes, other Greco-Roman historians also spoke of miracles but as a rule they did not present those miracles as “facts”, but in virtually all cases explained why they were repeating such unnatural events associated with historical figures and explained why readers should or should not believe the tales. A good number of New Testament scholars and Classicists have been able to identify the sources of many of the stories told about Jesus and they are adapted from other literary tales (not handed down via oral tradition). And what we have are stories written near the end of the first century or early second about a Jesus called Christ. We have no independent corroborating evidence to give us grounds for thinking that the stories are true. “Christ” was early and universally (by Christians) applied to Jesus. They called him the messiah so much that it became Jesus’ second name. You find this already in the writings of the New Testament – in fact, in our earliest author, Paul, who refers to him as Jesus Christ, Christ Jesus, or just Christ, as a name. For Christians, Jesus was the messiah. It is old scholarship that still claims Christ was used as a second name for Jesus among the earliest Christians. But that detail aside, yes, of course our earliest sources call Jesus the Christ. It is begging the question to say “you find this already in the writings of the NT” because we have no evidence for anyone calling Jesus the Christ before any of the NT writings. This claims is what made the Christian message both laughable and infuriating for non-Christian Jews. Most Jews knew full well that Jesus could not be the messiah. Jesus was just the opposite of what the messiah was supposed to be. The messiah was supposed to be the powerful ruler (earthly or heavenly) who destroyed God’s enemies and set up a kingdom on earth. Was that who Jesus was? Is that what Jesus did? Again, Ehrman’s claims here are based on a conventional view of old scholarship, of undergraduate scholarship at that. There was no single view that the messiah had to be a conquering king in this world. I have attempted to present in many posts the evidence that Jews were not united in their belief of any particular kind of messiah. One of the foremost Jewish historians today, Daniel Boyarim, argues that the raw material for the Christian messiah — the idea that the messiah was to die and be resurrected — was one of the extant pre-Christian Jewish ideas. I have posted further evidence that plausibly points to the same view not so long ago. The Second Temple Psalm of Solomon is sometimes used as evidence of the Jewish belief in a conquering messiah, but those who advance that psalm as evidence appear not to realize that that same psalm is drawn from the canonical Psalm 2 that presents the messiah as suffering rejection by the world. The notion of Davidic messiah itself expresses the concept of a messiah who suffers, who is persecuted, yet who in the end is raised by God over his enemies. That’s the gospel Jesus, too. That’s the messiah of the psalms. Jesus was not at all “just the opposite” because the earliest Christian teaching is that Jesus conquered a kingdom far more powerful than the human one and that he now sits beside God in heaven, continuing to scatter the powers of demons, and advancing his kingdom. I think Ehrman did not mean to say what he actually said in the above quote where he appears to admit that among Jews it was believed that the messiah was to be a powerful ruler earthly or heavenly. Heavenly is just what he became as a messiah, and the conquering of the kingdom of demons who ruled this world was nothing to be sniffed at. We have no evidence for the claim that all Jews believed that the messiah’s kingdom was going to be set up on earth. We have numerous indications of the contrary. The fact that Christianity emerged out of Judaism is one of the pieces of evidence itself. Precisely the opposite. Jesus was an obscure and virtually unknown rural preacher who was arrested as a criminal, humiliated, and tortured to death by the Roman authorities. It’s no wonder that most Jews found the Christian claims ludicrous. Courtroom, lawyer and detective analogies seem to be especially favoured by evangelicals and even mainstream biblical scholars. No doubt the comparison with judges and criminal investigators lends a certain aura of credibility and authority to the methods or arguments that are being buttressed by the analogies, but as we have seen here a number of times before the analogy is very misleading. Here I’d like to sketch several of the methodological principles that have emerged from these debates. As you will see, there is a real logic behind each of them, and the logic needs to be understood for the criterion itself not to seem hopelessly arbitrary. In particular, it might help to use an analogy: in many respects, the historian is like a prosecuting attorney. He or she is trying to make a case and is expected to bear the burden of proof. As in a court of law, certain kinds of evidence are acknowledged as admissible, and witnesses must be carefully scrutinized. How, then, can we go about it? In any court trial, it is better to have a number of witnesses who can provide consistent testimony than to have only one, especially if the witnesses can be shown not to have conferred with one another in order to get their story straight. A strong case will be supported by several witnesses who independently agree on a point at issue. So, too, with history. 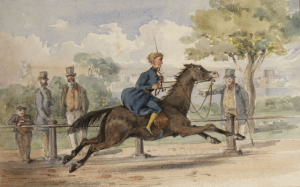 An event mentioned in several independent documents is more likely to be historical than an event mentioned in only one. 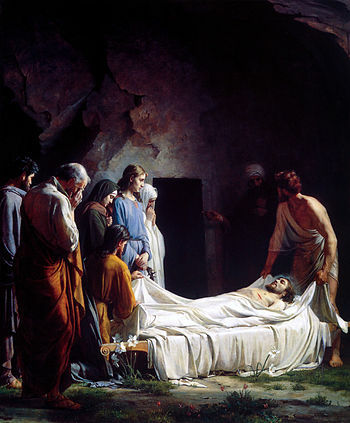 Matthew Ferguson has posted a very thorough article clearly setting out a weakness in Bart Ehrman’s argument with William Lane Craig over the probability of the resurrection of Jesus. I don’t think that Ehrman presents the strongest case against miracles (including the resurrection) when he defines them, from the get go, as “the most improbable event.” This kind of definition is too question-begging and it opens the door to the stock “naturalist presupposition” apologetic slogan. The reason we are looking at stuff like the texts that discuss Jesus’ resurrection is precisely to see whether such a miracle could ever be probable. Ferguson’s article clearly demonstrates the application of Bayes’ theorem in assessing historical evidence for certain propositions and he links to another article discussion the way probability reasoning works in historical studies. (I especially like his opening point in that article pointing out that history is not something that “is there” like some natural phenomenon waiting to be discovered but is a way of investigating the past.) The article also links to another relevant discussion addressing apologist arguments against the likelihood that the disciples hallucinated the resurrected Jesus. The article is Understanding the Spirit vs. the Letter of Probability. I won’t steal Matthew’s thunder by singling out here where he believes the emphasis belongs in discussions about the evidence for the resurrection. Suffice to say that I agree with his conclusions entirely. A welcome visitor to the blog has raised a question along with an answer by Bart Ehrman and I have promised to respond with my own thoughts. My first impression is that Ehrman’s response talks down to lay readers and protects them from the reality of the complexity of arguments and the debates among scholars. Ehrman’s responses also fail to acknowledge the arguments expressed in works he has strongly declared he has indeed read. This is a pity since those arguments actually address and rebut the same points Ehrman repeats with such confidence and authority. I have learned a lot from Erhman’s earlier works and I have often cited his works positively in my posts. But in responding to Ehrman’s post on Paul’s role in Christian origins I think it is necessary to be somewhat critical. My original hope to address his entire comment in this one post has had to fall by the wayside and I have only time to comment on his opening remarks here. The rest will soon follow. A lot of people (at least in my experience) think that Paul is the one who should be considered the “founder” of Christianity – that he is the one who took Jesus’ simple preaching about the coming kingdom of God and altered and expanded it into a complicated doctrine of sin and redemption, being the first of Jesus’ followers to maintain that it was the death and resurrection of Jesus that brought about salvation. This can’t be the case, because Paul was persecuting Christians already before he had converted, and these were certainly people who believed in Jesus’ death and resurrection. Can’t be the case? Bart Ehrman infers that the opinion is the preserve of ill-informed amateurs. I do not understand why he does not openly explain to his lay readers that a significant (if minority) number of scholars do indeed argue that Paul was the founder of Christianity and that it is a lively topic among scholars. Just Google the words Paul – founder – Christianity and you will see many pages of links dedicated to the topic — some by amateurs, but a good number involving serious discussion by scholars, too. Countless books have been written in the past hundred years arguing that Paul is the “founder” of Christianity, sharply distinguishing him from Jesus. and Barrie Wilson, How Jesus Became Christian, to name a few. My own new book, Paul and Jesus: How the Apostle Transformed Christianity explores these and many related questions. Just How Dangerous Is Mythicism? You could, of course, consider bluestone as a sort of MacGuffin. To be sure, we were learning basic chemistry; however, the main purpose of the text was to teach us the scientific method. At the beginning the book invited the student to consider the demon hypothesis, the notion that tiny invisible beings were causing our bluestone to react to exposure to heat, dilution in water, combination with other chemicals, etc. After each experiment we’d evaluate the results and alter our hypothesis. Eventually, we would develop a new, more scientific hypothesis — one that better predicted future experiments and more rationally explained our observations. Our so-called demon hypothesis had some features in common with other early natural theories such as the chemical theory of phlogiston, which postulated an imaginary, immaterial substance released during combustion. But it had even more in common with prescientific theories that required supernatural intervention in the natural world to explain mundane phenomena. 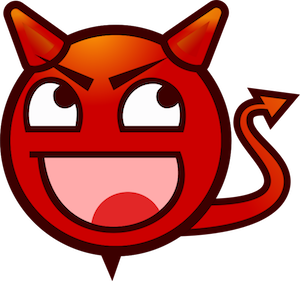 We could also draw similarities with the concept of the devil’s advocate, inasmuch as our placeholder hypothesis was obviously wrong and decidedly nonscientific (or even antiscientific). To hear Dr. James McGrath tell it, no variation of the Jesus Myth hypothesis has merit. In fact, he consistently compares it to creationism. Actually, he always takes care to call it Young Earth Creationism, in deference to Old Earth Creationism and Guided Evolution, pseudo-scientific theories he finds perfectly acceptable. I’ll try to update this page regularly . . . . — and do let me know of others I miss. Did Jesus Exist? Price/Ehrman Debate- Who Won? Who’s Next? Matt Dillahunty, Dr. Richard Carrier, David Fitzgerald and Kristyn Whitaker Hood join hosts Sean Fracek and Jason Lawson to discuss the debate. 21 October 2016 Mythicists: Did Nazareth Exist? 26 October 2016 Following that Debate: Do we follow the Facts or Do we choose what “Facts” to believe? 27 October 2016 Dear Professor Bart Ehrman, Please explain, if you will…..
Richard Carrier has posted his response to the Mythicist Milwaukee sponsored debate between Bart Ehrman and Robert Price on the question of Jesus’ existence. See The Ehrman-Price Debate. There are two major takeaways from all this. Second, why is Ehrman ignoring the peer reviewed literature in his own field? Why will he not address that, the case for mythicism actually vetted by Ehrman’s own peers, and instead debates Robert Price, whose arguments for mythicism have never passed peer review, many of which are even outright strange? This is a really weird thing to see happen in a supposedly professional academic field. If in any other field a consensus was challenged in its own peer reviewed literature, experts would analyze and respond to it in the peered reviewed literature, and there either publish flaws in it sufficient to warrant not changing the consensus, or they’d change the consensus. But here, everyone in the field is ignoring the peer reviewed challenges to the consensus in their own field (even Craig Evans didn’t read my book when he debated it with me), and fallaciously, circularly, citing “the consensus” as the reason to not even examine or respond to a peer reviewed challenge to that consensus—a methodology that would end all progress in every field were it adopted as a principle. Which is why no sane science would adopt such a principle. In fact, abolishing that principle is precisely what demarcated modern science from medieval and launched the Scientific Revolution. So how can any other field remain credible today, when it is still using the same irrational reasons to reject challenges to its authority as were decisively repudiated hundreds of years ago? This debate, alas, will not give you an answer. It just re-asks the question. I have also read many comments expressing disappointment that Bob Price did not challenge Bart Ehrman more. I felt the same way at the time but in hindsight I have become more philosophical about that. Ehrman was cutting Price off, interrupting him. Why bother trying to engage such a person in a rational discussion? The other party has demonstrated that they are not truly listening but rather are on the look-out for opportunities to jump in and object. We have all had experience with people like that. That Ehrman chose to turn away in mocking laughter at Price’s views on Paul also told us we were not witnessing a scholarly exchange. It also told us a lot about the limitations of current biblical studies and how even awareness of the history of the debates and controversies in their field have apparently been largely lost and forgotten (as distinct from having been answered and rebutted). I did the very best I could to communicate some rather difficult ideas in simple terms that were compelling and persuasive. As it turns out, only about half the audience (I asked at the outset) came into the debate convinced that there never was a historical Jesus. The reality is that I will never convince someone like that in a thousand years. 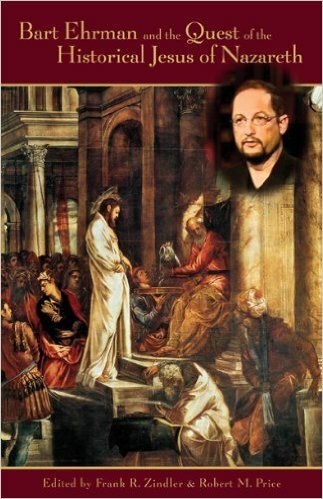 . . . .
With these words Bart Ehrman reveals his condescension towards mythicists and his distaste for even wanting to hear out the arguments. He is very out of touch with his audience. He fails to realize that many of us are totally frustrated with his “simple terms” of argument because we really do understand and know far more about the arguments of the academy than he can bring himself to admit. Has he really read an Earl Doherty book? Or Rene Salm’s? Or Thomas Brodie? His response to Frank Zindler’s question also testified to the arrogance of his refusal to engage with the arguments that mythicists make, his disdain towards the thought of even acknowledging that those arguments do indeed grapple with the “rather difficult ideas” that he assumes are beyond the ken of his audience. Bart further demonstrates just how far out of touch he is when he guesses that Bob Price’s talk would have been beyond the comprehension of the audience. He seems to be indicating that he has no idea why Robert Price is so popular and such a draw-card for the audience. He seems to be assuming that Price’s arguments are so complicated that no-one could really appreciate them — but hey, he already says mythicists are a pretty dumb and ignorant lot. And now he is saying that he is quite prepared to believe they follow Price without having any idea what he is talking about! Then again, given that Bart himself finds it laughable that any scholar could doubt Paul wrote Galatians . . . one does have to ask who it is who has no idea what he is engaging with. I think Bob Price is right. These guys need to be answered, but as for any attempt at exchange of ideas or real debate? Why bother! This post concludes my notes on the Milwaukee Mythicist sponsored debate between Bart Ehrman and Robert M Price. It is based on notes I took as I listened, and since I have not listened to this part of the debate since, I cannot check my notes for accuracy or to add any completeness. Perhaps some readers will find it useful to compare René Salm’s notes. BE = Bart Ehrman and RMP = Bob Price. There were two ten minute sessions for each of BE and RMP to question the other and this was followed by a Q&A with the audience. I have coloured the topics addressed in BE’s ten minute sessions red, and those in RMP’s blue. I have inserted my own comments in blocked off sections. Where do our external (non biblical) sources mention Caiaphas, the most influential Jew of the day, or Josephus? The non-mention of Josephus doesn’t show he didn’t exist. In responding to Price (RMP), Ehrman (BE) rejected RMP’s argument that scholars pare away the miracles from the gospels to find the historical core. RMP had said stories of the miraculous were said to be beefed up retellings of more mundane events, but BE said that’s not the methodological approach of scholars. I think BE was implying the use of various criteria of authenticity, e.g. the criterion of embarrassment as the reason we can accept the baptism of Jesus as historical. Rather, BE insisted, they evaluate every story, e.g. the baptism, to determine its likely historicity. They don’t simply remove the miraculous elements. Who were the “archons” who killed Jesus? Earthly or heavenly authorities? Next point against RMP was the claim that “archons” killed Jesus. BE pointed to Romans 13:3 to show that the term archon refers to earthly rulers. RMP’s point is valid, but it could be coupled with other places where archons definitely means spiritual powers and other accounts of the crucifixion in Paul to undermine the dogmatism of the historicist view. RMP: but Paul says these earthly rulers should be obeyed because they are there for your good, so he would not be identifying the crucifiers of Christ with archons who do good. BE: What Paul is saying is that yes, the same kinds of authorities who killed Jesus should be obeyed and you should not do anything to upset those authorities or you risk suffering punishment as did Jesus. Rejecting arguments because of the date of the author is hardly a valid scholarly method. We would prefer to see the arguments from published criticisms of Schmithals. RMP’s points in his opening talk made a lot of sense. In response to RMP’s discussion of gnosticism, BE insisted that gnosticism belonged to the second century and cannot be used to build a picture of pre-Christian times. BE also dismissed Walter Schmithals (whom RMP had referenced) as now dated, from the 1950s. Why question the historicity of the empty tomb? RMP asked BE how he came to not believe in the historicity of the empty tomb. We ought not begin with the presumption of historicity or nonhistoricity in any text. The genre, provenance and external witness to the narrative ought always take priority. Resorting to details of contrary customs is not a strong argument by comparison. BE replied that it was standard Roman practice to leave crucified bodies on crosses and later toss them in a shallow grave. RMP asked BE what he thought or Burton Mack’s model that Christianity did not begin with a resurrection big-bang but with many disparate communities with different ideas eventually coalescing. What scenario is the more probable? BE’s question is a form of question begging. To ask which of two options is more probable implies that both options are on the same playing field, both are either in the real historical world, or both are in a certain fictional world, etc. BE addressed RMP’s discussions in his book (The Christ Myth Theory and Its Problems) about probabilities. We have no references in our sources about the activities of a Joshua in outer space. We don’t have stories about Jesus in outer space in the New Testament. All our references always speak of Jesus on earth. Is it not more probable that Jesus was on earth and not in outer space? Again, we have many accounts of Jews crucified by Romans and no accounts of Jews crucified in outer space. Paul does not talk about Christ in outer space. So again, where lies the probability? RMP replied that Colossians and 1 Corinthians do speak of a heavenly Christ. Again, on probability and the baptism of Jesus. BE criticized RMP’s sourcing ideas to the influence of Zoroastrianism. Why is it more probable that the baptism is based on Zoroastrian concepts than to a historical baptism by John the Baptist? Dear Professor Bart Ehrman, Please explain, if you will…..
Mythicists often argue – one of them named Rene Salm has written an entire book arguing – that Nazareth did not exist. And if no Nazareth, then no Jesus of Nazareth. I have always found this argument to be not only wrong but flat-out silly. I probably won’t use the word “silly” in the debate, since I don’t want to insult anyone, but really…. So the reason the argument on this point by the Mythicists is wrong is that it’s been proven to be wrong. The reason it is silly is this. Suppose we grant the point that Nazareth didn’t exist (even though it did). How would that have any bearing on the question of whether the man Jesus was an actual historical being? Saying that Jesus did not exist because he could not have been born in Nazareth is like saying Barack Obama does not exist because he could not have been born in America. I am mystified. Though you “have always found this argument to be . . . flat-out silly” (I agree it is silly) I have never heard René Salm (or any mythicist) make that argument. 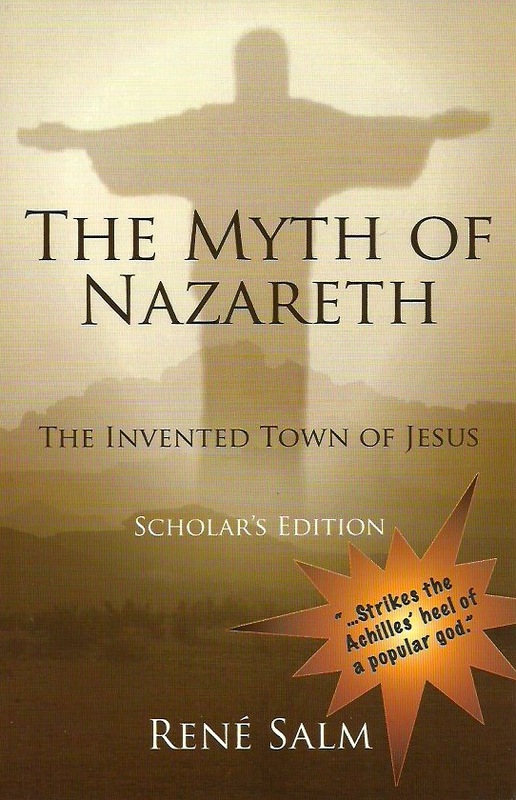 In fact Rene Salm nowhere argues that because Nazareth did not exist therefore Jesus did not exist, neither in The Myth of Nazareth (that you read prior to writing Did Jesus Exist?) nor in Bart Ehrman and the Quest of the Historical Jesus of Nazareth (in which he responded to your book DJE? and that you assured us you read “twice”). If Nazareth did not exist in the time of Jesus, then questions quickly arise: Why did the evangelists place him there? Was there something regarding his real provenance that they found objectionable? What was that provenance? If Nazareth was a persistent and recurrent invention in the gospels, then we leave the realm of error and enter the realm of elaborate fiction. This recognition would require a fundamental reappraisal of the Jesus story, and a paradigm shift in Christianity. . . . . The implication is . . . irrefutable: if there was no Nazareth before his birth, then Jesus did not come from Nazareth. . . . . It is not my intention here to question the conventional understanding of Christian origins, that a man by the name of Jesus . . . lived in Palestine in the early first century CE and inspired the religion we now call Christianity. . . . I restrict consideration to the archaeology of Nazareth, with the purpose of showing that the provenance of Jesus, as set forth in the gospels, is not historical. He — whoever he was (or wasn’t) — certainly was not Jesus “of Nazareth” in Lower Galilee. . . . It remains to be determined why the evangelists found it necessary to invent such a Jesus. Would you like to explain what has prompted you to now impute such a silly argument to René Salm in particular and inform us who the mythicists are who have published that argument? A Mythicist like Salm argues that yes, it did exist in different periods of history (still exists today as a city, as those of you who have visited Israel know). But it was uninhabited in Jesus’ day. You may notice that the argument that it existed but was uninhabited contradicts the argument that it never existed; some of the mythicists are not terrifically consistent in their logic, from one argument to the next. After you made a similar false charge in DJE? Salm corrected you on this point on page 341 of Bart Ehrman and the Quest of the Historical Jesus of Nazareth. In the Q&A at the end of the Milwaukee Mythicist sponsored debate with Dr Price you assured us all that you had read that book “twice”. So the question arises: Since Salm has made it consistently clear that it is the site, not the town or village, that was uninhabited in Jesus’ day, why you continue to repeat this disinformation. Secondly, I don’t claim that “the town came to be reinhabited” but that the site came to be reinhabited. It may seem like a minor detail, but the first chapter of my book shows that a settlement indeed existed in the basin in the Bronze and Iron Ages. It was not called “Nazareth” but “Japhia” [MON 53–55]. Again, one wonders if Ehrman paid attention to the book. Plugging one’s ears . . .
Salm also, I should note, argues that the ancient place of the city could not have been on the hillside where it has traditionally been located but two kilometers away in the valley; he also points out that archaeologists have never dug in this alternative site. But then he argues that therefore it never existed there. Well, if the site hasn’t been excavated, how could there be “evidence” that it never existed?